Gutters are troughs that surround the edge of your roof collecting rain water running off and dispersing it the ground, through proper slopes, to your downspouts that carry the rain water to the ground and away from your siding, windows, doors and foundation. Gutters also pick up leaves and other debris, so it is necessary to get them cleaned at least once a year so they can properly channel the water to the ground. If not, water will spill over the edges which can cause harm and damage to your home. 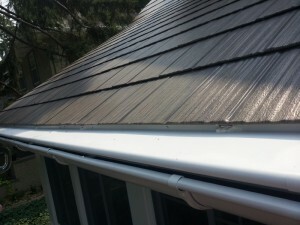 How do Gutters Help Protect Your Home? A roof by itself is not able to protect the home’s exterior completely. A typical home sheds around 28,000,000 cubic inches of rainwater each year. All that water must be directed away from the roof line to prevent water damage to the home’s exterior. It is important to have the correct gutter system installed on your home because it is designed to be free-flowing without the potential for backups and clogs allowing for proper expansion and contraction on the home. If the rain water runoff is not guided away or allowed to clog, it can cause damage to your roof line, fascia & soffit, exterior, windows and surrounding landscape, and even your foundation. Gutter Guards — The goal of gutter guards are to prevent clogs by letting water flow to the gutter while keeping debris out. There are many types of guards on the market, but not every type is right for your home, so understanding exactly how each system works will allow you to choose the one that’s best. Gutter Covers — A gutter cover is a small screen or small-scaled roofing system installed above your gutter to stop debris from falling in and clogging drains or diverting water. There are many different types of gutter covers specifically designed to various roof pitches, roofing materials, or home designs. It is important to know what gutter cover you are purchasing, as gutter screens work best when they are matched specifically to your regional needs. Leafless Gutters — The Leafless Gutter system is a low-cost system designed to keep your gutters free from leaves and debris, which can clog up your system. Leafless gutters can generally be installed onto new or already existing gutters. If you have any questions about different gutter options and accessories, call Minnesota Leafless Gutters today at 612-221-0362! We will work with you to help you stay off the ladder and safely on the ground!